With your support, TechnoServe made a difference in the lives of 2.3 million people last year. 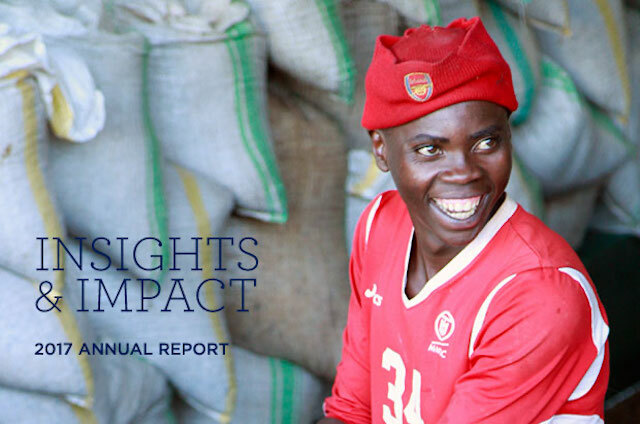 Our annual report shares achievements from 2017, as well as lessons learned, in order to catalyze more effective change in the future. For 50 years, TechnoServe has been guided by our founding belief in the power of private enterprise to help people lift themselves out of poverty. The effectiveness of our pioneering approach is borne out by our own results as well as current trends in development. Yet we know that there is more work to do to crack the code on eradicating poverty. That is why, as we look back on five decades of TechnoServe’s work, we reflect not only on what we have accomplished, but also on what we have learned. Reflecting on 2017 alone – when we expanded operations into two new countries, supported corporate partners like Nespresso to gain customer recognition for creating shared value, and helped improve the lives of 2.3 million people – we ask ourselves: What worked? What could have worked better? What are the key takeaways for achieving better development results in the future? As a commitment to cultivating a culture of continuous learning at TechnoServe, this year’s annual report highlights five projects we completed in 2017 and shares their impact as well as lessons learned. In some cases, these lessons stem from opportunities to innovate within the project design. In other cases, we gleaned insights by identifying areas where project design did not fully anticipate market realities, so we adapted our management approach and documented the new direction. In still other cases, we collaborated with external evaluators and researchers to supplement our own measurement and analysis and reveal key trends that can help future projects replicate and refine our work. With your continued support, we can apply our proven methodology and our learning to catalyze effective, lasting change for millions more people. Explore TechnoServe's 2017 Annual Report below or download here.